Well, NaBloPoMo is over, and I met my goal of posting each day. Some entries were lesser in quality than others were, but I made it through, and it also helped me to reconnect with blogging. Of course, I am, once again, behind in emails, comments, and reading, but that is nothing new. I am really glad I did this, and having you all stick with me all the way through has been wonderful. NaFiSweMo is over, too, and I achieved my goal with that. Most of the time when I finish a sweater, I am so sick of it that I have a hard time finding the love for it, but not this time. 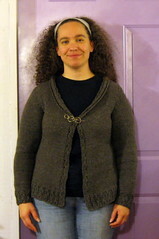 I am so very pleased with my new sweater, and I have not taken it off since I finished it. I have already received wonderful compliments on it, and my friends can tell that this is a sweater that I will wear often. Salt Peanuts is a great cardigan, the color I chose is perfect, and I have even more love for the yarn (Patons Classic Wool) than when I started. I do not think I could ask for more. In something of a surprise, bringing my colder weather clothes into the rotation and putting the summer ones away for the year did not coincide with a burst of unseasonable warmness. Instead, it is still cold, and I get to wear the pajama pants I made for myself. Yeah, I have a sewing machine and play with it a little, but it is not getting much attention because knitting gets all of my free time right now. Speaking of that, I need to get back to that last seam. Cyber Monday and all of its coupon codes and emails have been raining down on me, and it finally got to me. So, a little bit of yarn fell into an online shopping cart, and will be on its way to me soon. Nah, I did it on purpose because there is some yarn I needed for gifts that I just do not have. The truth is, I already had the yarn in the virtual basket, but didn't get around to sending in the order until today. I kept fretting about colors, but it is a good thing I did spend extra time checking that, because I almost made a big mistake. Speaking of yarn for gifts that I do not have, I bought some bulky yarn. As you know, that is not really my style, but I understand that there are some sparkly vampire movie fans in the family, and I think those mittens would make great gifts for a couple of people. They were chatting the movie and books up while we sat around and visited after Thanksgiving dinner, and that is when I got the idea. Speaking as one who has not read the books, I will say that I am not much interested. I did watch one of the movies when it was on tv the other night. My nose was so stuffed up that my mouth was hanging open, and I could not think or do much, and from the commercials I had seen, that seemed to go along with the movie, so I lost a couple of hours to it. It just is not my deal, but I really do not care that other people love it. I kid around a bit, but I do not want to make fun of anyone enjoying a book, movie, or music. We all like what we do, and I hate to see people feel ashamed about things like that. Anyway, can you believe that this is the 28th day of the month? Time has been so weird for me lately, and I was quite surprised when I realized that there are only two more days left this month. I keep plugging along on my NaFiSweMo project, but I need to kick it into a higher gear if I am to make my goal. I have one sleeve set in, and it took longer than I had planned, but the second should be quicker. Of course with these colder than average temperatures, (they say we are getting snow tomorrow) each moment with the pile of wool on my lap is good, and it is great incentive to keep working on it. I cannot make any promises for better photos of hats I knit, but with this new model to help, I might have a chance. The head is a gift from my friend, Helen, and I love it! Now I just need to get busy knitting a hat. Not settling in and seeing my way all the way through to the end of one thing is really not paying off for me, or so it seems. From knitting to reading to housekeeping, I just have overwhelming piles of unfinished-ness everywhere. Then again, I am making my way through several things. Right now, it is just difficult to see that I am making any progress, but little by little, I am chipping away at it. I am going to keep on keeping on, and I will have something to show for my efforts soon. Happy Thanksgiving! This is a favorite of mine, and it does my heart good to celebrate a day of thankfulness. Every day, of course, there are many reasons to choose to feel thankful, and I know my days are better when I make this choice. I am grateful to be joining in with others in celebrating this day, and whatever I do today, I hope it shows. So, what is with the title of today's post, you might ask? Well, the son purchased a house last month, (another reason to be thankful) so this is his first Thanksgiving in his new home. He played the part of the host for the big shindig. Since he is still very new to learning about the mysterious happenings of the kitchen, (so many stories) we brought the food. Weird, wacky, and wonderful do not even begin to describe the day, and I do not have enough words to describe how thankful I am for it all. The cranberries are cranberrying, the pie is chilling, and the squash and friends are assembled and waiting for their time in the oven. I just have to stand on the Wii Balance Board with the turkey to see how early I need to get up in the morning. Everything else will wait for tomorrow. Our weather continues to bounce from warm to cold with some rain in between, but I know that we will continue to have more cold days. That has kept me from just letting the pinned out pieces of my cardigan sit until next week. The seaming of Salt Peanuts is underway. So far, I only have the shoulders and half of the collar done, but it is progress. Once I get the sleeves in place, I think the challenging parts will be done, and the rest should go smoothly. Having The Knitter's Book of Finishing Techniques by my side always helps. Wanting to curl up in a new sweater and read a book or three helps, too. In a fit of madness, I almost considered beading the nupps on the Swallowtail Shawl I am knitting. That led me to trying to decide whether I want to bead or nupp. After that, I got lost in the stash, and I do not have a clue as to how that happened. Several more leaps followed, and I was on Ravelry looking at patterns. Then I was calculating yardage on some handspun. Then I was back on Ravelry trying to figure out what to do with 75 yards of laceweight. Then I was dizzy and my Tuesday was over. I hope yours was more productive. Perhaps I need a jumpstart of sorts, because I am having trouble getting this week going. I feel like that guy from the Cheerios commercials back about thirty years ago. You know, the ones where the chalkboard stick guy tries to ride his bicycle up a hill, but then rolls backwards. I tried to find a video, but my google-fu eludes me at present. The good news is that I made it to the grocery store, and I do not think I will have to return until after Thanksgiving. The other good news is that people are having a lot of squash this year. I know this because I saw someone taking the last two from the bin and then receiving apologies from employees about there being no more. Maybe I need coffee. I think I have only had a couple of cups of it so far this month. Yes, coffee is probably the answer. At least I think it is, but now I have forgotten the question. I am more excited about this than is reasonable, but there you go. p.s. I think that the music on the cd might be perfect (for me) to weave to, but I cannot explain why I think this. I confess; Salt Peanuts is still pinned out, waiting for seaming time. I cannot determine if it makes it better or worse that it took me several more days to get it out of the water and blocked. I just could not crawl around on the floor with pins, schematic, and tape measure without going into a coughing fit. Anyway, that is my excuse, but I will get to it soon, because I want to wear this sweater. It just occurred to me that I need to make a decision on the closure. The pattern uses a ribbon, but I am not sure about that. I have not spent much time looking at ribbons, but nothing I have seen thus far does it for me. I do not think I want to go the button route, but it is a possibility. There is always the option of using a shawl pin or stick I suppose, but for now, I am thinking of using i-cord. It should work, and it would blend in with the rest of the sweater. Then again, I might just be using the closure issue to avoid settling in for a long seaming session. Ever since Joan started The Cupcake Fiber Co, I wanted to experience her creations, but the opportunity always seemed to slip away, just when I thought my time had come. However, thanks to a thoughtful birthday present, it is my turn! Oh, how I love my bfl/silk batts, the color is gorgeous, and the spinning is a dream. Some people are more challenging than others are when it comes to giving gifts. My stepdad is like that. He tells people to just forget about getting him anything, but that seems wrong, especially when I know of something he will like and use. Several years ago, I knit a hat for him. It was a plain, black, superwash wool hat. It bore a great resemblance to cheap, black hats that can be purchased anywhere. However, it was what he wanted, he liked it, and he has worn it often. Since wearing the handknit wool hat, he now knows the difference, and appreciates how it keeps him warm without making him sweaty. The problem is that he has several of the cheap, black, acrylic hats from the store, and is pathologically unable to get rid of anything. He keeps grabbing one of the bad hats, and then remarks how it is not as good as his wool hat. I figure the solution is knitting another hat for him, but not black. Right now, he is in Afghanistan. He was back for a couple of weeks in October, and it was clear that he was skimping on his cold-weather clothing. 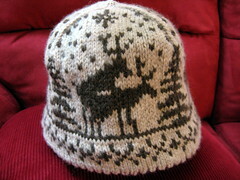 I would hate for his frugality to hurt him when there is something I can do to help, so I decided to knit a hat for him. I tried to be sensitive to the fact that he prefers boring plain, so I chose some calm blue, and instead of a colorwork pattern, (which really adds warmth) I knit with three strands of yarn at once. This ought to keep Papa warm this winter in Afghanistan. Free childcare? Hrm--I think I meant something else. I do love being an aunt; it is one of the great joys of my life. In the biggest surprise of the year thus far, my sister told me that I will appear even auntlier towards the end of April. Our minds are still swimming over this news. My mom has been buying new things for the baby, and my grandma is crocheting and quilting away. As for me, I am waiting to find out what brand it is before I start anything. The projected date for that news is sometime in the first week of December. Since my sister's big announcement, I heard the rumbling of a rumor, and then confirmation of said rumor. My brother and his wife are giving serious consideration to increasing my auntliness, too. Shhhh--that might be a secret, though. Well, I am going to have to check everyone else's Ten on Tuesday lists, because I do not have that many ways to use cranberries. Instead, here is a shawl on the tenth budding lace chart repeat on a bag of cranberries on a Tuesday. Finally, the knitting of Salt Peanuts is complete! All of the pieces are soaking their cares away and looking forward to being pinned out into their cute sweater shapes. They are optimistic and believe that the seaming will go smoothly, and that the sweater will fit. Until it is time to put it all together, I am getting my daily dose of fiber. I am taking two and trying again in the morning. The annoying cold continues to drag on, but I think my brain is getting closer to coming into focus. I have high hopes for a more productive week. I had better be more productive, because my lying about has me behind on housework. Last week was also complicated by three or four days of Aunt Sarah duty due to an ill nephew, and then Veteran's Day on Friday was time with both the niece and the nephew. The parade was good, and then I fell asleep for a few minutes during Puss in Boots. Anyway, assuming that no one caught my cold, this week should be calmer. Maybe I can even prepare for next week; it is going to be a big one. Not only will there be Thanksgiving, but also more Aunt Sarah duty. My sister hopes that I will keep my nephew this weekend so that she and her sweetie can have a weekend away. Her hopes are about to be dashed. I want a weekend away with my sweetie, but I know this is not the time for that. I will settle for having some time to knit and watch Dexter. I just received last season's dvd set, and I am ready to see what happened. I so enjoy settling in to watch a television show on dvd, just escaping from my brain for a few hours. I picked up a little yarn at a sale several months ago, and when I showed my purchases to my mom, she took a special interest in a ball of mystery laceweight. She usually joins me in oohs and aahs over pretty yarn, but I could tell that she could see that yarn becoming something for her. This discussion reminded me of another we had about shawls a few weeks before, and I began to formulate a plan. Then, the idea melted away with eleventy-billion degrees of the summer. Well, it is not summer now, and her birthday is not too far away, (but not too close to do this) so I think it is time to plan for her new lace. I have been flipping through my books, and I have some ideas. I know that she is looking for something triangular and not too big. That gives me many options. I could use an established pattern and knit it as written. However, I could take a stitch pattern and use it to plan a pattern on my own. I guess that can be called designing, but that feels like too grand of a term. Anyway, the first step is to calculate the yardage on my mystery laceweight yarn. As that is not my strong suit, that might be the most challenging part of this process. Probably not going to knit as much tonight. However, I did finish plying my little sample from the yarn store, so I did get my daily dose of fiber. Armhole shaping, neck shaping, pattern reversal for collar, and short-rows for collar worked at the same time; read the following instructions all the way through to the end before proceeding. Of course, the best part about that means that I am really closing in on the end of this piece, and that feels good. I also think it will feel good to wrap up in this sweater. I think it is going to be very cozy and comfortable. I hope that I am right about that. After this, I can move on to other knitting. While I did briefly feel the need to cast-on for something new, I think I am feeling more like finishing other knits first. First up on the finishing list, of course, are the Sea Mineral Mittens. I think that will pretty much take care of the w.i.p. pile, and that is another good feeling. Then, I will move on to some gift knitting. I just found out that someone has lost his hat and would really like a new one. I understand that there was even an offer to pay, but I just do not want to get into that. If they want to do something, they can, but I would rather not have that discussion. I will knit the hat, and knowing that it will be appreciated and worn means a lot to me. When I cannot concentrate, I am grateful for the Random Wednesday. I have to rip back an inch on Salt Peanuts because I was not measuring and knit too far. I do not mind it too much, because I was busy visiting with knitbuds. I have hope that I will finish this sweater soon because our weather is predicted to be freezing on Friday and 80 on Monday. NaBloPoMo is still fun, and I am glad to be able to say that. What I do not like is that it is no longer on its own site and has been absorbed by BlogHer. Perhaps I would like the BlogHer site more if I gave more time to exploring it, but I kind of doubt it. I find it to be too busy, redundant, and a bit tedious. I want to stay true to my Salt Peanuts, but the itch to cast on something new is getting stronger. Maybe I can satisfy it with a MochiMochi, but only after I get the cardi on the right track. Then knitting something new is like a reward for good behavior, right. Wait--do you hear that sound? It is a close-to-complete pair of mittens declaring that they should come before anything else, even a Teeny-Tiny MochiMochi. As I have been suffering snuffling along with this stupid cold for the past few days, it was easy to compile a list for this week's Ten on Tuesday topic. 4. Chicken Soup--They say it helps, and they say if is all mental. I really do not care what they say; I just know that it feels soothing when I am sick. When I made my bold declaration that I would finish a sweater this month, I knew that at some point it would mean actually picking up the pieces of my long-neglected Salt Peanuts and assessing the situation. Now that I look at it, this big, crumpled pile of gray wool no longer feels overwhelming. I can see how it may not look very promising right now, but I am so close. I just have to finish one of the front pieces; I just have to figure out where I am in the pattern. Yeah, letting this sit for so long was not one of my better choices. I do not even remember why I set it aside. Probably, it was because the weather turned horribly hot and I could not face putting more work into something when it seemed like it would be ages until I could actually wear it. Now, however, our weather is featuring cooler temperatures on a more frequent basis, and I want to have my new cardigan. Additionally, Helen has joined me in the agreement to finish a sweater this month, and I do not want to let down my accountabilibuddy. I super-swear this is not an excuse to put-off my deadline knitting. I am working on it, and it will be done soon, too. Now it is just a race to see which I complete first. How about a story to start our time together? However, this is neither the story of a grasshopper nor an octopus, but rather, a cricket--My New Cricket. A while back, (the morning of Bruce's surgery, to be exact) I found an excellent deal on a used Schacht Cricket Rigid Heddle Loom. I love this little critter! It is portable, compact, I enjoy weaving with it, and the loom waste is minimal. While I have not had as much time as I would like to weave, I have managed to finish one scarf already. I thought I was going to be weaving a different pattern (weaving is still very much a learning adventure for me), but I really like what I wove. I might donate it to the Red Scarf Project, but as it is not superwash, I am not sure. *I still believe Futurama to be the most quotable show, even though these are the kinds of quotes I tend to share. With weather like we are having, it makes it much easier to keep a positive outlook. Here's hoping wherever you are, everything is wonderful, and (if it applies in your area) you enjoy your extra hour this weekend! I am currently red-nosed, too. It is nothing more than an annoying cold, but it has certainly done its part to disrupt life. It managed to mess with the car keys, and I came home from the grocery store with a rather odd assortment. Still, the down time has led to a little extra knitting time, allowing me to make it to the heel turn on the sock, so that is good. Bunnies are Good Luck, Right? Oh, how I hope it is true, because I think we need some. Right now, my hope is that we have finally fixed a pesky plumbing problem. I look forward to the time when we will have hot and cold running water in our home all day, everyday. We are now into our third week of this, although we have been able to have water most of the time, so it is not quite as awful as it sounds. So far, it is looking like we have fixed the problems, (no, this is not the first time we have thought this) and it is finally time to put everything back together and repair what was done to reach the troubled pipes. I would cross my fingers, but that interferes with my knitting and spinning. We have a new yarn store in town. I finally had the opportunity to stop in and see it for myself. It was great to see the vision Nina has for the store, and she even put on a pot of coffee so we could sit and chat for a bit. I had a great time at Fiber Art Work, and picked up a little bit of yarn for something I will probably knit after the first of the year. Not only does she have lovely yarn, but she also has a wonderful selection of spinning fibers. Some of those came home with me, and she included a bonus sample for me to try, too. To get the word out about her store, she is giving out samples of fiber or yarn each month to anyone who joins her Ravelry group and requests the sample. Then if you create something with your sample (spin the fiber or knit the yarn) and share a picture of it in the group, she will send you another sample the following month. It is open to both local fiber folks as well as those far away. I love my sample batt, and cannot wait to get it on the wheel. It probably does not bode well for my NaBloPoMo goals that I did not finish my sort-of-Socktober socks. Seeing as this is just a plain pair of toe-up socks that I began well in advance of the start of the month, it is pretty sad that they are stalled at just one and almost one-half. I do understand why they are sitting on the needles, just waiting for me to make the time for them. Since it is just plain stockinette, I can really zip along with them while not giving any thought or attention to what I am doing. However, they are quite close to the heel-turn, and that means I need to put my focus on what I am doing. No, intense concentration is not necessary for the heel-turn itself, but some is for making sure that I begin it at the right time. It is just too easy to zone out and keep going round and round without thinking. Once I get the heel started, the sock can return to its rightful place as anytime mindless knitting. It also promises to be a convenient excuse for avoiding some deadline knitting that I ought to be doing right now.